During the day, only the name and logo of the company is seen on the poster. 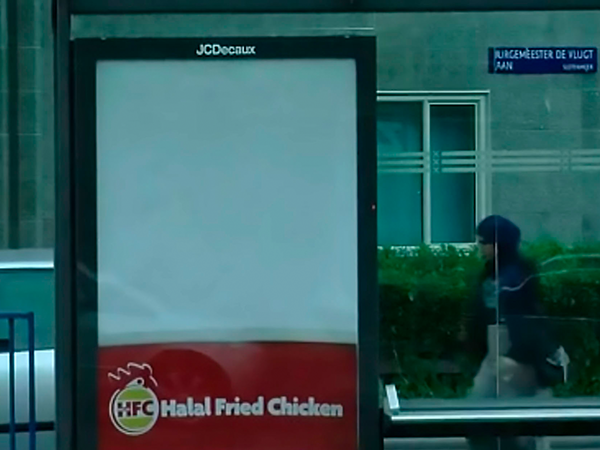 A Kentucky Fried Chicken spin-off offering halal fast food made a remarkable advertising campaign where the posters are only visible after sunset. During the Islamic fasting month of Ramadan, observant Muslims are not allowed to eat and drink from sunrise to sunset. 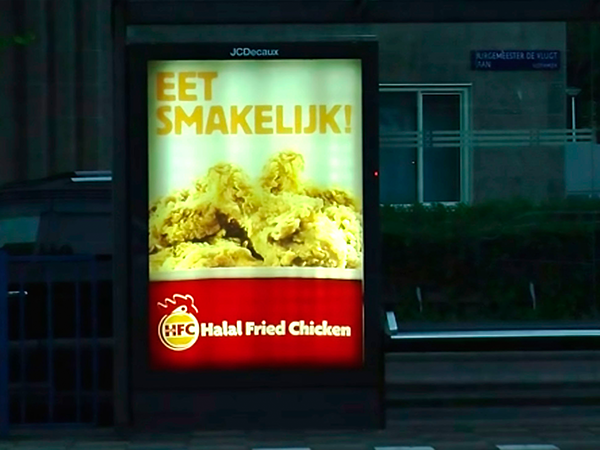 Dutch fast food chain HFC - Halal Fried Chicken, a spin-off of the American giants Kentucky Fried Chicken - used the Islamic fasting season as inspiration for a viral campaign. The franchise, which has four restaurants in the cities of Rotterdam and Amsterdam, designed unique posters which only light up at night, thanks to a special printing technique. The ad is situated at bus and tram stops in both cities. But when the sun sets, a tasty bucket of fried chicken is visible together with the words "eet smakelijk", meaning "enjoy your meal" in Dutch. The name and logo have been printed on the front side of the poster, while the rest is printed on the back and only gets visible when the lights of bus and tram stops automatically go on after dark. 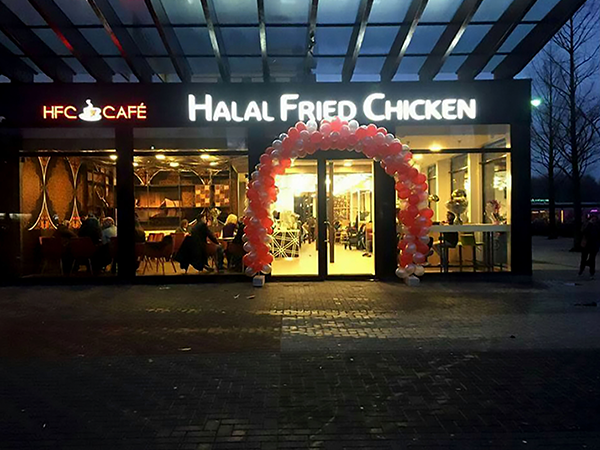 Halal Fried Chicken, which was started by three Turkish-Dutch entrepreneurs, offers special menus for Ramadan and remains open until after midnight to offer Muslims plenty of time to eat with their families. The daily breaking of the fast after sunset, called "iftar", is often used by Muslims to eat with their extended family and friends in restaurants.